The Earth Element within each of us is our way of connecting to the world. When it is aligned we are able to move into the world with more presence and strength. The earth element sits within our Root Chakra, a chakra associated with safety and security. When this element is out of whack, we find ourselves unbalanced, prone to anxiety and stress, and indecisive. Those around us may say we are, "up in the clouds." Theae poses are a great way to practice embodiment and perseverance. 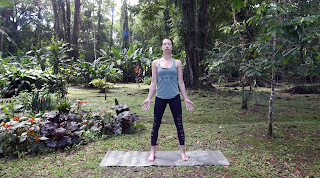 We will hold standing poses longer than normal, connecting our roots (feet and legs) to the Earth. Moving through the motions mindfully, not rushing through transitions, each pose will be held for about 1 minute (or 10 deep breaths). We will also add in some balancing poses as we ground ourselves. 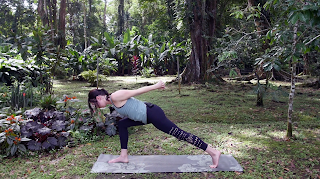 The following 7 poses are pulled from a 45 minute practice on my YouTube channel, Earth Element Flow. 1. 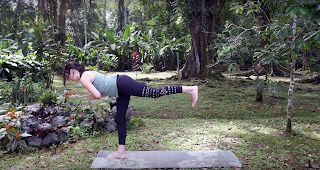 Mountain Pose - Begin standing with feet set wider apart than normal. Find a steady foundation by lifting and spreading the toes, and then grounding down through all four corners of the foot. Rest the arms down at the sides, with palms facing forward. Keep a micro bend in the knees, and relax the shoulders. Close the eyes and notice how you feel in this moment. Notice the connection of your mind and body to the Earth. While here, move through some pranayama. Inhale, visualizing glowing red energy moving upwards starting at the soles of the feet, coming to the base of the tailbone (where the root chakra resides). As you exhale, release the red light back towards the ground. Set an intention for your practice. Think about what in your life needs more strength and perseverance, grounding and stability. As we move forward, make your practice an offering of this. 2. 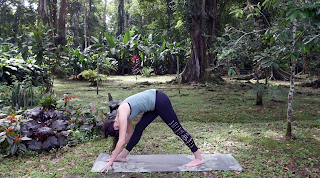 Forward Fold - Standing at the top of the mat, with feet hip width apart, bring your hands behind the back and interlace the fingers. Bend your elbows, rest the hands on the tailbone, and squeeze your shoulders onto the back. Gaze forward to open up the chest. Bend the knees generously, as you hinge forward, folding all the way down. Straighten the arms as you reach the fingers up and over. Let the neck relax and the head feel heavy. Notice what is happening in your foundation, aka the feet. To take the stretch deeper into the shoulders, bend deep into the knees and lean onto the left shoulder, lifting the right shoulder and looking up. Let the head relax as you breathe into the stretch and hold. Take the stretch towards the other side. 3. 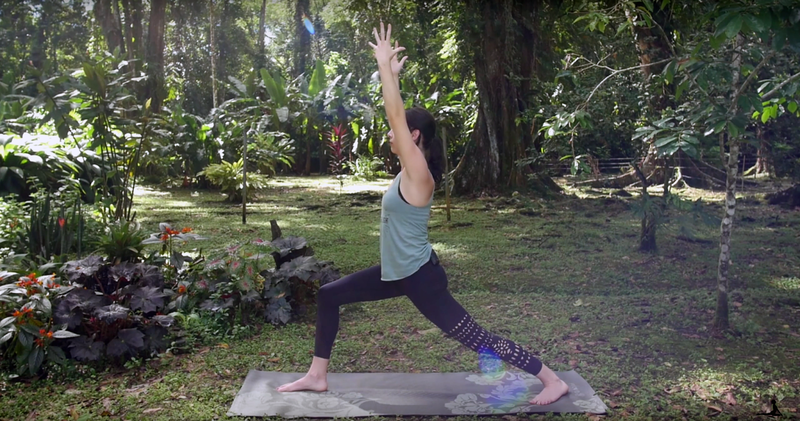 Low Lunge - From your forward fold, bring the fingertips to the mat, and step the left foot back. Lower the left knee down to the ground, as you inhale the arms up overhead. Reach the tailbone down, hugging the knees toward the midline. Lengthen up through the arms. If your legs are the roots, then your arms become the branches, lifting up toward the sun. 4. 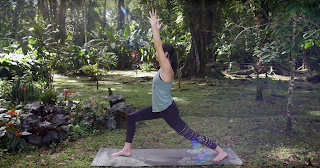 Warrior 1 - Returning the palms down to the mat, lift the back knee. Ground the heel of the back foot down, and turn the toes out at a 45 degree angle. Keep the right knee bending deep. Float the arms up overhead, reaching for the sun once again. Square the hips and shoulders to face forward, and engage the core. As you exhale sink down lower, grounding down to the Earth. Find stability. Find your power. Keeping legs as they are, bend elbows into cactus arms. Open the chest toward the sky, arching the spine and taking a back bend. Repeat Low Lunge and Warrior 1 on the other leg. 5. High Lunge - Come first into downward dog (vinyasa optional). Kick the right leg up behind you, and then slowly step it through towards the front of the mat. This time keep the left heel lifted, lift the torso, coming into high lunge. Reach the fingertips toward the sky. Bend deeply into the front knee, which may mean also taking a small bend in the back knee. Lower the arms and interlace the fingers behind you. Fold forward, coming towards the thigh as you reach your arms up and over. Try to keep the upper body hovering off of the thigh (unless a rest is needed). Shine the crown of the head forward as you sink deeper into the lunge. 6. Pyramid - Bringing the hands to the hips, walk your back foot in a few inches. Square the hips and shoulders to the front. Shift the hips back to straighten out the front leg. Tilt your pelvis forward, keeping the hips squared off. When the torso comes parallel to the mat, hold. You may want to take a small bend in the front knee before moving on, and hug the legs toward one another to keep them engaged. Reach the arms forward, strong and stable. After holding for a few breaths, release the upper body all the way down into your full extent of pyramid pose. 7. Warrior 3 - From Pyramid, leave the fingertips down as you float the back leg up. Check in with your hips, both sides should be pointing down to the mat. Slowly bring your hands to heart, leaving the mat one at a time. Switch sides and make your way through High Lunge, Pyramid and Warrior 3 with the left leg forward. 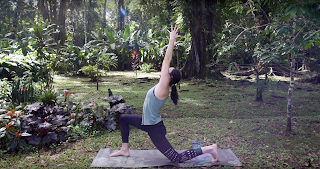 If you want more movement, please join me for a full 45 minute practice in the video below.